I was at Google Singapore office yesterday for training on Google Cloud Platform Fundamentals: Big Data & Machine Learning. During the training, I was introduced to a huge range of products in the GCP suite designed for big data. Throughout the training, my instructor Eefy Lin has repeatedly boasted about how fast and robust is BigTable and BigQuery. It's hard to believe that a table could have millions of columns and billions of rows, and process queries of that size in a few minutes. Naturally, I thought the best way to be convinced is to prove it to myself. 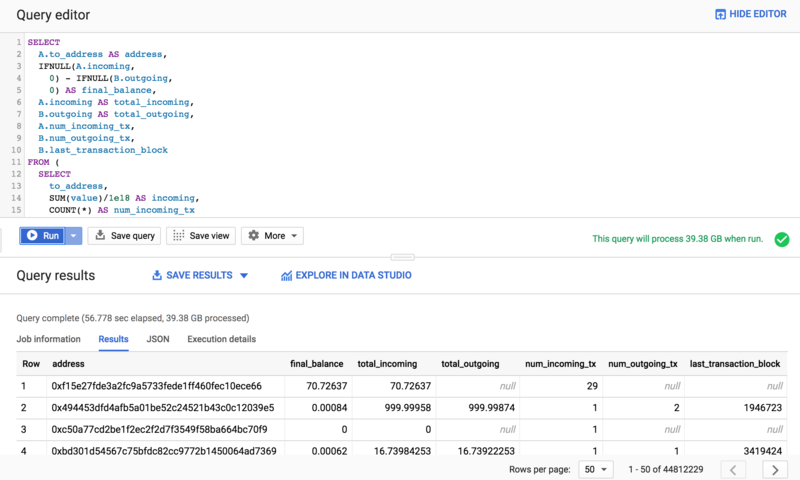 I started looking for the public dataset on BigQuery to play with. 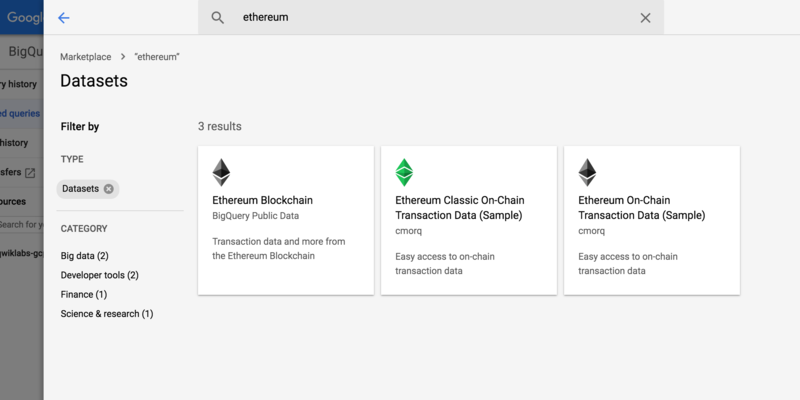 When browsing the dataset available on BigQuery, I chanced upon the Ethereum Blockchain Dataset (data synced by Google Cloud, with a Parity node) and thought why not this? Turns out, creating a snapshot of all balances on the Ethereum blockchain is not hard! The public dataset has a database of all transactions. That means summing up all the incoming and outgoing value transfer will get you the final balance on the accounts. Looking at the data, I found some anomaly with the results. There were some rows with negative final balance! While the data is far from perfect, it was sufficient for me to have a good understanding of the balances of all the accounts and have it all in a single trusty database that I can perform a join on. If you were looking to conduct an airdrop, you can definitely use this method to obtain the proportion of the total number of ethers one own on the blockchain. To top it up, you can even exclude accounts that are smart contracts by removing those accounts found in the contracts table. Obtaining a table of all the balances pave way for me to figure out the top-value contracts in subsequent queries, but we'll leave that for another post!